Chinese paramilitary police officers wear face masks to protect against pollution as they stand guard before the daily flag-lowering ceremony, surrounded by smog, in Tiananmen Square, in Beijing, December 9, 2015. A version of this article was first published in Party Watch Quarterly Report 1|3, published by Party Watch Initiative, a project of the Center for Advanced China Research. At last year’s 19th Party Congress, Xi Jinping vowed to confront the “principle contradiction” facing Chinese society: “the contradiction between unbalanced and inadequate development and the people’s ever-growing needs for a better life.” While the legitimacy of the Chinese Communist Party (C.C.P.) once rested in its ability to deliver prosperity to the developing nation, Xi Jinping’s statement bluntly acknowledged the Party’s responsibility to deliver more than just material gains. 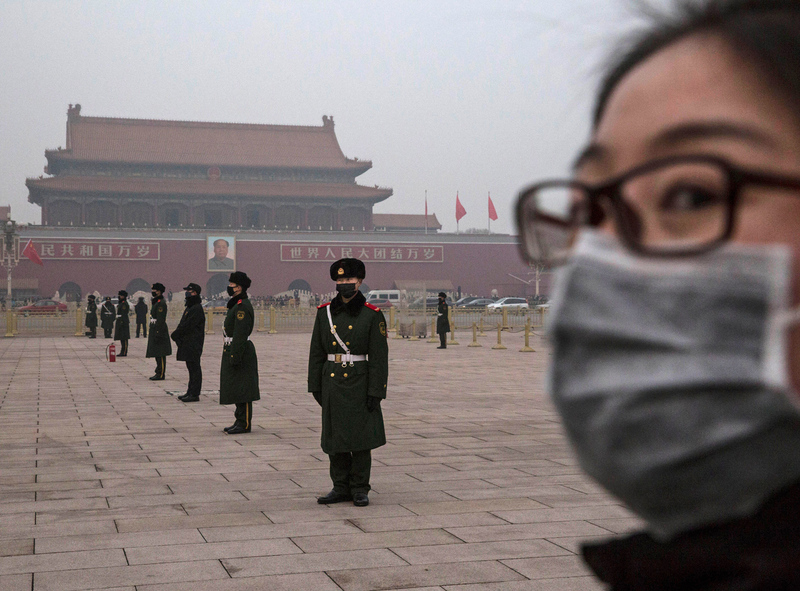 China’s pollution crisis is, of course, the quintessence of this contradiction. The C.C.P. cannot continue to pursue economic growth at the expense of its environment without running a major risk to its legitimacy. To handle these challenges while maintaining its comprehensive power, the National People’s Congress (NPC) voted in March to establish new superagencies intended to strengthen the C.C.P.’s hand in tackling key political threats. The new Ministry of Ecology and Environment (MEE) has absorbed all of the previous responsibilities of the now-defunct Ministry of Environmental Protection (MEP) and the environmental work of six other government agencies, confirming the Party’s commitment to environmental protection and pollution control. Meanwhile, a new anti-corruption superagency, the National Supervisory Commission (NSC), with sweeping authority ranked higher than the judiciary, will extend the reach of Xi Jinping’s anti-corruption campaign. While the two ministries cover different portfolios, their work is becoming increasingly interrelated as Xi’s “war on pollution” moves toward rooting out corruption related to ineffective environmental oversight and increasingly emphasizes the role of “political responsibility” in tackling pollution. With such priorities, the war on pollution will strengthen the power of the C.C.P. not only by tackling a key threat to Party rule, but also by leveraging the power of the newly-enhanced anti-graft drive to emphasize the absolute primacy of the C.C.P. over all matters. The role of anti-corruption in cleaning up the environment has grown steadily since Li Keqiang declared a “war on pollution” in 2014 to signal the government’s firm commitment to resolving China’s intensifying air pollution crisis.The following year, the amended Environmental Law gave authorities enhanced tools to target environmental violations, changing the focus of environmental authorities from environmental impact assessments and construction approvals to compliance and responsibility oversight, indicating a role for China’s anti-corruption organs in environmental work. Soon after, China’s anti-corruption organs began speaking and writing publicly on the role of corruption in China’s environmental problems.Their work began at the very top: following reports that officials at the MEP had been bribed into allowing highly-polluting facilities to continue operating, the Central Commission for Discipline Inspection (CCDI), the Party’s own discipline organ that oversees Xi Jinping’s extensive anti-corruption campaign, announced an investigation into the retired MEP Vice Minister, Zhang Lijun. Months later, China’s State Council sent an inspection team to Hebei province to conduct a month-long review of the province’s implementation of environmental regulations which included a contingent from the CCDI. As environmental inspection teams had previously only been deployed by the MEP, the move broke with tradition and demonstrated that the war on pollution required the weight of a stronger authority than the MEP. Indeed, the success of some anti-pollution measures in recent years has been credited to the fact that the campaign has the explicit backing of the CCDI. Since spring 2018, Xi Jinping has doubled down on the emphasis on anti-corruption work in the fight against pollution with calls to strengthen the role of the Party in cleaning up the environment and by emphasizing the role of “political responsibility” in the campaign. Since the speech, discipline organs have taken a keen interest in environmental issues, publishing articles on the importance of anti-corruption efforts in environmental protection and reprinting commentaries from important Party outlets, presumably for the purpose of demonstrating the resolve to carry out central demands and rallying discipline inspection bureaucrats to join in the war against pollution. Local discipline inspection and supervision units, presumably at the behest of the CCDI and NSC, have begun issuing reports on how they have successfully dealt with cases of environmental damage related to corruption, published on the CCDI-NSC website. The reports appear to demonstrate the local discipline inspection units’ dedication to environmental protection and serve as examples of good practice for other inspection units. In the Xi Jinping era, officials have frequently invoked “upholding the leadership of the C.C.P. Central Committee” as a solution for a wide range of problems facing the C.C.P. or Chinese society. However, it should not always be dismissed as hackneyed propaganda speak. To the contrary, demands to enhance the “guiding role” of the Party in environmental issues reflect the C.C.P.’s strategy for winning the battle against pollution—one of the “three tough battles” that must be won in order to overcome China’s “principle contradiction” as defined by Xi Jinping. Due to the past success of the CCDI’s involvement in efforts handling perpetrators of environmental violations, the C.C.P. is doubling down on the central role of anti-corruption organs in the war on pollution. Given the high degree of public attention given to pollution-related corruption issues by the CCDI and NSC since Xi Jinping’s major speech in May, observers can expect that cracking down on violators of environmental regulations will become an increasingly important focus of the anti-corruption campaign.